Mrs. Moreau’s Warbler: How Birds Got Their Names is a bit different than earlier efforts I’ve seen in this line. 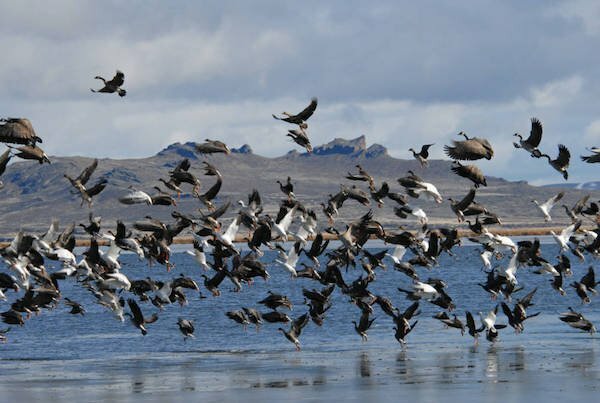 Those books – notably Lapwings, Loons, and Lousyjacks by Ray Reedman – tend to be divided taxonomically. This makes them ideal as reference when you want to check some folk etymology against some facts, but doesn’t lend itself to reading cover-to-cover. Not so Mrs. Moreau’s Warbler, which boasts a narrative format suitable for pleasure-reading. 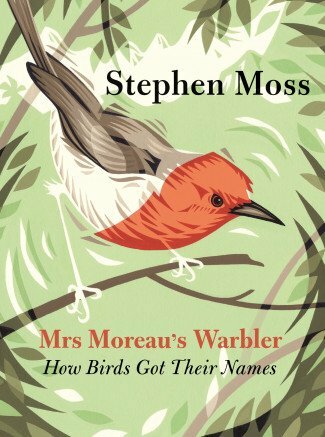 Author Stephen Moss, after introducing himself and his subject matter, starts with the earliest origin of English-language bird names in Indo-European, giving place of honor for the oldest bird name still in circulation to “Goose“. Then he divides his subject matter both chronologically and by naming rationale, so that early-established bird names based on sound and appearance are paired with a discussion of the various waves of language to colonize the British Isles (out with the erne and in with the Eagle, out with the gowk and in with the Cuckoo), naming of unfamiliar birds for familiar ones with early British colonization of other places, the golden age of back-slapping bird naming for friends with the establishment of ornithology as an organized field of knowledge practiced by men (mostly, at the time) of science, etc. In doing so Moss not only elucidates the names themselves, but the evolution of a certain way of looking at and talking about the natural world. He even takes us into the future and the naming implications of the increasing fuzziness around the edges of the species concept. Most of the book has a relatively jolly, though not unserious, tone – this can be a bit jarring when discussing, say, the European invasion of Australia, but suits most of his subject matter well. Like any good bird-names book it demolishes a few false etymologies – my favorite is the one that assigns the term Isabelline to the color of a queen’s dirty underpants – and introduces some true ones that seem stranger than fiction. A good fun read for bird nerds and word nerds alike. Interesting that this is a narrative-style book. Does Moss only discuss British birds?